The Bulldog's basic needs. Is a bulldog the right dog for you ? 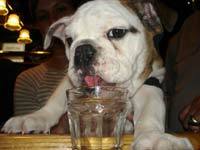 Bulldogs are very special dogs that require special attention and care. They are not an easy breed to have and most bulldog breeders and owners alike agree that they are not fit for a novice dog owner. It is true that everyone has a first dog at some point, but bulldogs are just not recommended for first-time dog owners. If you have had a dog before, think about what you liked about him, and read the following to find out if a Bulldog may correspond to these expectations. If you'd like an active dog to go for long walks or motivate you to go jogging or cycling, a bulldog is probably not the right breed. 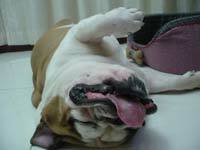 Bulldogs do need some exercise at regular intervals but they are very intolerant to excessive exercise. You should be able to foresee the right length of the walk or you may end up carrying your 25-kg-heavy-dog all the way back home. Typically, a bulldog, at first, will run like a maddog, then collapse with weariness flat on the floor, all four feet stretched. A Bulldog is an indoor dog. They should not be left alone outside for longer periods of time. Some bulldogs may have breathing problems due to the specific structure of their face and nose and are very intolerant to heat, but also to cold. If you live in a very warm climate, your Bulldog will need an air-conditionned room when the temperature becomes too hot. If you live in a cold climate be sure the main place your Bulldog lives in is sufficiently heated and not too draughty nor humid. Unlike their short coat may let suppose, bulldogs need regular grooming and care. Their eyes and wrinkles, for example, need to be cleaned daily. More a a about the everyday care of your bulldog. 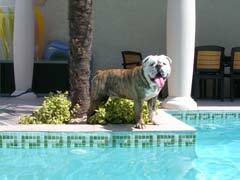 More than with any other dog, your Bulldog's food has a bearing on his coat, health and temperament. Food free of allergenic components like fresh meat (poultry or lamb) or fish mixed with boiled pasta or rice and easily digested vegetables, or high-qualiy dry food especially designed for bulldogs (see below) are best for your Bulldog. 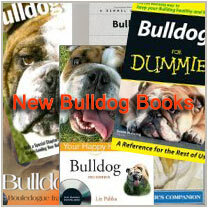 More about feeding your bulldog. the Newest Bulldog Mugs to start the Summer season in a funny "bulldog" way ! © All rights reserved by the author, 2003-2009. No part of this article may be reproduced without the author's written permission. 3 months old Jack with "puppy cocktail"
Last but not least, Bulldogs need attentive owners because their strong will and legendary courage (once used to fight bulls) make them rarely complain. Many owners confirm they have rarely heard their bulldog whining. 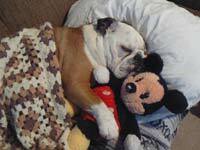 It is up to you, the owner, to always check that your Bulldog has everything he needs for his well-being. That's one of the main reasons why bulldogs are not recommended for first-time dog owners. The Bulldog Information Library 2003-2008 © All rights reserved. Bulldog Zsu Zsi spooning her favorite toy. This is the flea product we at Bulldoginformation.com use for our dogs ! A new generation flea product using fipronil, a new insecticide, that is active against the now largely resistant flea populations. It also contains a product that kills flea eggs and larvae and is also effective against ticks. Frontline Plus stays on even with bathing, swimming, or exposure to sunlight (but it is recommended to wait 2 days after application before bathing your dog). Can be used on puppies 8 weeks of age and older. A product with highly digestible proteins, specially formulated for bulldogs. 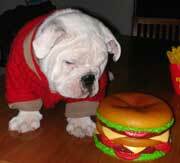 The shape of the food definitely helps to slow down bulldogs and forces them to chew the food instead of swallowing it whole like most Bulldogs do, which helps digestion. Their skin looks shiny and sound and they LOVE the taste of the food.